It’s a life-changing Truth. Obvious when you think about it – and yet sometimes hard to grasp. He knows our need. 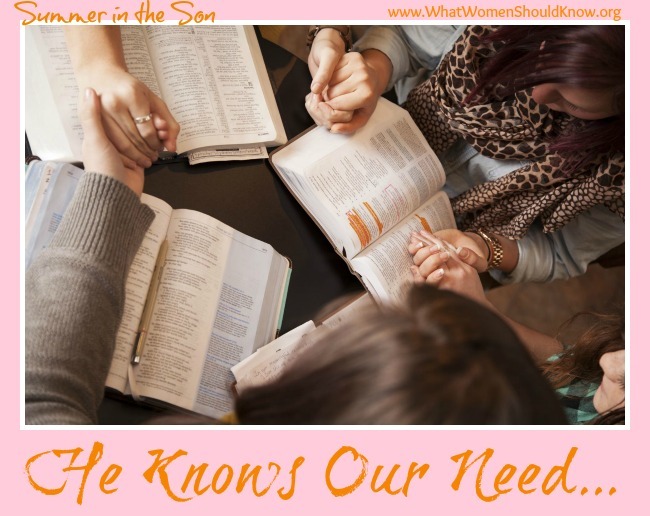 Jesus knows already – before we ask – what we need. Better than we do. And He’s already prepared to meet that need, if we’ll just ask! We’re reading through the Gospel of John together — spending our Summer in the Son! Not long ago, I had the privilege of hearing my friend Jennifer Kennedy Dean teach on The Wedding at Cana (John 2:1-11). Jesus and His disciples were guests at this wedding, and His mother was there, too. The hosts ran out of wine early in the evening – a real crisis for people living in their culture and their day. The servants brought the problem to Mary, and Mary brought it to Jesus. And yes, there are times when God gives us just the right words to say. Times when He clearly moves us and stirs us and speaks through us in our prayers. There are times when we pray the Scriptures or things we know are His will. But there are times, as Jennifer points out, when we need to keep it simple. We need to resist the urge to tell God what we feel He should do or what we think should happen, mistaking this for prayer. 1) We don’t know enough to come up with the right answers, the best answers. We don’t see the whole picture; we don’t know all the facts. Our finite minds aren’t capable of imagining solutions that our Creator God hasn’t thought of or couldn’t come up with on His own. 3) If we get into the habit of talking to God as though He needs our advice, we’ll get pretty upset when He doesn’t take it. Frustrated, angry, disappointed, disillusioned. And what happens on the day we can’t come up with an answer? In that situation for which we have no solutions? When we so desperately need to draw near to God, we don’t even feel like we can pray. Because we got nothin’! We don’t realize we never did. It was never our responsibility in the first place. Bring Him the need. Leave it with Him. Can you think of a time past when God met a need in your life in a way that you would never have thought to ask – in a way you could not have imagined?